Back cover blurb: 'Franko Baxter roamed the streets of London in the unlicensed mini-cab he drove for Mr Innocent of Fantastic Cabs. When he wasn't picking up passengers, he was on the heath kicking a football with his friend Ginger or anyone else who was around. Quick flick reveals: Hunter Davies is now best known as a top Beatles biographer, but he has written a number of novels over the years. 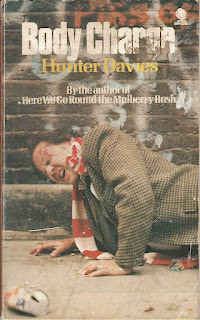 I thought this one was going to be about football hooligans, but closer inspection reveals it to be about murders, and football, and homosexuality, and taxis... or something. Random paragraphs: 'He put his hand on my shoulder. I pushed him away. Come round any time, he said. Come round tonight. He was having a few people in. He knew there were several young people there I'd love to meet. That cover is hideous, but the book is great fun. We're actually republishing it with a new intro by Hunter Davies.